Lincoln offers the Portable Aquatic Lift (PAL), which requires no mounting to the pool deck. The PAL is powered by a 24-volt rechargeable battery. Handheld automatic controls provide convenient control for all users. The PAL has a lifting capacity of 300 pounds, yet can be easily maneuvered to any location. The PAL is easy to use and is a perfect fit for facilities requiring accessibility to more than one location. The unit can be left in place or stored away when it is not needed. 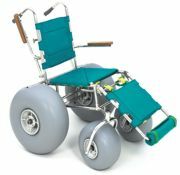 The Landeez all-terrain wheelchair allows you to enjoy the health benefits of a variety of outdoor activities. It is great for trips to the beach, strolls in the forest and for accessing unpaved areas in the neighborhood. The Landeez rolls over sand, snow, gravel and soft soils with remarkable ease. In the same way adding an addition to a house increases living space, the Landeez provides more living space for one's life. Finally, enjoy total access even in rural settings together with family and friends. 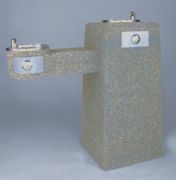 The front approach ADA "chilled" aggregate drinking fountain is designed for those areas where drinking fountain position is as important as the cold water it provides. The push button is located on the side of the arm instead of the end. The position of the push button for the main pedestal is in the standard location. This fountain is recommended for areas with high sand and salt conditions. It also is recommended for areas with aggregate site furnishings and amenities. The Model ADA 3900 SM is chilled, aggregate, dependable, low-maintenance, weather-resistant, surface-mounted and available to order today. Quaker Plastic Corp. offers its new EZ Steps for swimming pool access. The new EZ Steps are an adjustable four-tread, drop-in set of steps that fit multiple pool wall heights. The unit is constructed of high-strength polyethylene for stability, durability and maintenance-free use and comes with two powder-coated handrails for corrosion resistance. The EZ Steps are easy to install and store—installs in minutes and compact for easy storage when not in use—ideal for disability and rehab program use. People of all abilities can be part of outdoor recreational activities with wheelchair-accessible picnic tables from Pilot Rock. Rectangular tables can offer access at one end, both ends or at the center. Pilot Rock's unique, patented Universal Access Table includes access at both ends, plus full-length seating for everyone. Square and round table styles are also available with wheelchair access. Both portable and stationary table designs are included. Accessible tables are available with tops and seats of lumber, aluminum, recycled plastic or vinyl-coated steel offered in a wide variety of colors. 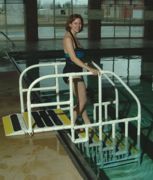 Spectrum Products provides ADA-compliant water-powered assisted-access lifts. The Swim-Lift Gallatin and Lolo WP400 have new features—improved performance and new low retail. Features include streamlined base stands with same dual anchor points for added stability. With set back accommodations from 18 inches to 30 inches, the supportive and spacious seat facilitates ease of transfer under any condition. Includes swing-out footrest, two armrests with outer armrest flip-up, 400-pound lifting capacity and up to 12-inch water draft. Ascension presents a revolutionary wheelchair lift: the Ascension Virtuoso 5460F, a new lift that features permanent installation for use in any type of construction. The lift has a sleek, state-of-the-art design and provides reliable access to stages and other elevated areas. The Ascension Virtuoso 4860P portable wheelchair lift also is available for access to multiple stages, platforms and risers. Ascension wheelchair lifts are the optimal choice for schools, colleges and universities, recreational facilities, convention centers, etc. Though an aquatic lift is a beginning, AquaTrek is the next step that gives you more to offer. 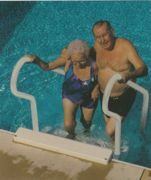 With AquaTrek, your organization can provide a forward-walking entry and exit for the pool that is dignified, safe and easy. Custom-designed for each facility, with portability built into the design, pools can maintain services for both competitive and therapeutic clients. A 600-pound rating ensures durability, while customer service will aid in your choice to help you gain the best AquaTrek access for your facility.